Brigadier General John E. Michel is the Commanding General, NATO Air Training Command-Afghanistan; NATO Training Mission/Combined Security Transition Command-Afghanistan; and Commander, 438th Air Expeditionary Wing, Kabul, Afghanistan. 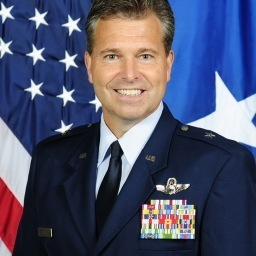 In addition to serving our nation as an active duty General Officer in the United States Air Force for 26 years and counting, General Michel enjoys helping people learn to walk differently in the world so they can become the best version of themselves possible, something he addresses in his book, Mediocre Me. General Michel is a widely recognized expert in culture, strategy and individual and organizational change. An accomplished unconventional leader and proven status quo buster who has successfully led several multi-billion dollar transformation efforts, General Michel has dealt with business transformation at a scale that most of us will never see in our lives. Here he shares with us his words of wisdom and expertise. These leadership lessons from the military can be translated for business and commercial organizations anywhere. Leaders realize it's about people, not things: When you work a lot with technology it can be easy to confuse priorities and become infatuated with the technology. Strong leaders put the people first and leverage technology to make them more efficient. Leaders take smart risks: This infers that things may go well or they may not go so well but either way, you have to be willing to try. Strong leaders have the courage to do the right thing. Leaders are willing to fail forward and try again: Strong leaders realize things will not always work out the way they would like and when things don't go their way they regroup and realize that every opportunity is an opportunity to begin again, only smarter. 2. Co-create and collaborate with individuals -- Fear is a very significant issue that individuals and organizations have when they are moving into something that is uncomfortable. To combat fear when trying to drive transformation in an organization, leaders need to make it a top priority to involve every individual in the organization in the process of co-creation. General Michel's rule in guiding people through change is to put his vision in pencil, not marker. This communicates that you know that the whole organization has ideas on how to get you where you are going. "Creating a completely collaborative approach going forward is the only way to remove the fear of failure," says Michel, "When people are involved in that process they are willing to go to uncharted territory." 3. Include stakeholders throughout the process -- Speaking from experience from his time at the U.S. Transportation Command, which leverages a significant information backbone and has a massive group of stakeholders, General Michel advises involving key stakeholders as broadly as you can on a consistent basis. Sending a memo at the beginning and then filling them in on how it worked out at the end of the effort is not going to cut it. After establishing an initial vision, leaders should engage in an aggressive campaign to include stakeholders throughout the process. This consistent communication makes stakeholders feel they have a role and a shared understanding, reducing resistance and making them more apt to contribute. "No matter what business line you are in you will never go wrong if you involve people in the process," says Michel. 4. The customer is the common ground -- General Michel emphasizes the customer point of view by saying that any of us in business are in business to serve someone else. Getting everyone calibrated to the customer, making the customer the center, makes it easier for everyone to find a common ground to connect to. "If we all have a shared and beneficial outcome in serving our customer, we have a unified place where all our interests converge. Success is not defined by our own personal and business line goals; success is in the eyes of the customer," says Michel. 5. Demonstrate clear intent -- According to General Michel, the best organizations and individuals operate on disciplined thought, leading to disciplined action. He says one of most important things a leader can do is to supervise clear intent, which is something the military does well. The best organizations provide clear intent -- clear expectations to people about what you are doing and where you are going and clear expectations of what you need from people and what you expect them to do. Maintaining this high-level of transparency creates a state of trust where individuals are willing to share challenges and creates a culture where leaders will provide the resources they need. These conditions that a leader sets establishes how well organizations and individuals can pivot and be agile in doing what needs to be done, allowing the organization to shift and move with the changing demands of the marketplace. 6. Use technology tied to metrics to enable transformation -- General Michel calls IT a "force multiplier" and says that technology has been an enabler and accelerator for the military in Afghanistan enabling them to achieve the success much more quickly and cheaply in the face of shrinking timelines, budgets and personnel. To avoid technology that comes in late and over budget due to changes in expectations which quickly make the technology irrelevant, Michel says you have to closely monitor and utilize performance-based methods informed by clearly stated goals and objectives along way. "There is a propensity for people to add on, change and modify and overtime we end up off course. If we don't clearly tie technology to metrics, the initial intent can be sidetracked and lend itself for being irrelevant for what you originally intended to use it for," he warns. 7. Break projects down into smaller components -- In order to be more agile, stay within the budget and keep projects relevant it makes good sense to modularize capabilities. Wise leaders will look at a massive problem and start to immediately break it down into a series of components, align to see who is best able to handle those components and then orchestrate them into a collaborative whole. According to General Michel, the military has mastered this. He says that it's important to look at achieving effect by bringing the least amount of force upon the right place in a system to achieve what you want. 8. Push the boundaries of your potential -- In his book, Mediocre Me, General Michel focuses on achieving personal performance and helping people to figure out what is holding people them back from realizing their full potential as an individual or as a change leader in a world that needs talent more than ever. He says that if we don't push the boundaries of our potential we will start to atrophy and live much smaller lives than we are capable of living. People in this state of "prolonged equilibrium" enter a state of denial that they are capable of doing things and being more. 9. Be morally courageous -- For a leader to be morally courageous they must be willing to do something that is unpopular. They must be willing to make choices that are consistent with their values, even if that means going against the flow to do what they know is right. This can be an uncomfortable place and leaders need to have the courage to lean in when it would be easier to fall back. Leaders are especially under scrutiny by people who are looking on to see if they are going to walk the talk. In this way, we all going through serious levels of disruption, even in our personal lives. While courageous leaders say that pushing the boundaries is a smart, calculated risk, there are times when they also need to take a leap of faith -- it is in these leaps of faith where growth occurs and we inspire others. 10. Invest in lifelong learning -- General Michel is fortunate that the U.S. Air Force provides many opportunities for academic training and being on the move ensures he is constantly being exposed to different people, ideas and opportunities to stretch and actualize his potential. His parting advice to leaders of all industries: "Make lifelong learning something you believe in and invest in. The combination of personal commitment to making a constant investment in yourself and leveraging what your organization will afford you is where you become well-rounded and maximize the skills, attitudes and capabilities you bring to bear." You can watch the full interview with Brigadier General John Michel here. Please join me and Michael Krigsman every Friday at 3PM EST as we host CXOTalk - connecting with thought leaders and innovative executives who are pushing the boundaries within their companies and their fields.